This web page explains some of the differences found between American Indy Car racing and European Formula One racing. Much much more money is spent in F1 these days. This results in the highest driver salaries and the highest tech cars. The teams are huge and they often fabricate their entire racers. While NASCAR was gaining in popularity in the United States, F1's audience has grown tremendously throughout the rest of the world. F1 races in more countries. F1 begins the race from a dead stop, Indy Cars begins the race at race speed. Indy Car drivers win prize money. All series award trophys and points toward a season's championship. F1 never races on oval tracks. IRL and CART race on both. F1 drivers are not as fan accessible. F1 teams actually do win prize money, they just don't talk about it much. For instance If an F1 team finishes in the top, they get a $10 million bonus for travel money for the following year. IndyCars are easier and more fun to drive. "Europeans are used to royalty and there is a similar relationship between the fans and Formula One as with royalty. In the United States, racing is much more for the common man and the whole paddock arrangement is organised to provide access for the fans, so they can get close to the cars, and talk to the drivers." "In America the chief difference has been the lack of upper-crust interest. American oval-track racing has never had the approval of high society in the way road racing is patronized in Europe. I don?t know of any President officially attending the Indianapolis 500, while European aristocracy has been going to road races since Kaiser Wilhelm II allowed the German Grand Prix of 1904 to be known as the Kaiser Prix and took his entire court along with him to watch the proceedings. So American racing tended to remain a grass-roots activity, poor and technologically stunted by comparison with the European scene. But this made it interesting from another point of view. With so little development in design, the emphasis fell instead on the driver. It was man against man rather more than machine against machine. "Ultimately, though, technology changed the balance on both sides of the Atlantic. As the science of metallurgy advanced and computers were called in to design the cars, the romantics and the merely brave were squeezed out of the big leagues to be replaced, for most part, by appropriately cool and most singularly dedicated athletes." make sure you get the proper Mustang wheel spacers. 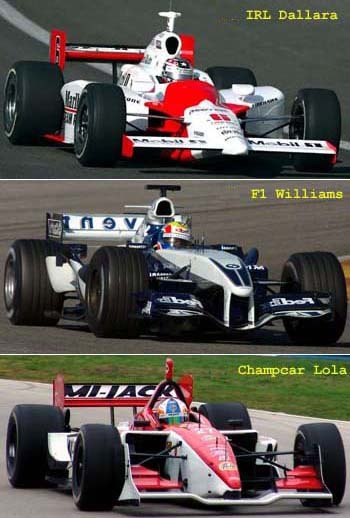 F1 Racing: You came from ChampCar, and now we've got (Juan Pablo) Montoya. What is the difference between that series and F1? Jacques: Competitive-wise? Oh, F1's definitely a step up. I don't know why, I guess it's because the States is more laid-back in general. We were always having a laugh out there. I never trained then. I jogged and went skiing a bit in the winter, but that was all, and I was still good enough to win. You didn't have to race like you qualified, like you do in F1 where every lap is flat-out. The pressure is much greater in F1 and it's more international - the fan-base is much bigger. There's also a lot more money involved because the teams design and build their own cars unlike in ChampCar where they buy their cars off the shelf, make a few adjustments and that's it. For starters he discovered that Europeans are "very chauvinistic", more so than Americans. In general he thinks Americans are a little more open. This wasn't any sort of criticism, just an observation. As for F1 he had a lot of observations, some of which will come as no surprise. "F1 can be very parochial, very provincial. With the exception of Ferrari, almost everything about F1 racing is centered in England, a big chunk of it in a very small part of England. This," he said, "breeds a very narrow view. F1 is a very sterile environment." He equates CART with accessibility and F1 with exclusivity. In F1 he said, "there is more value attached to exclusivity. For the fans there is a tremendous difference between the two series. The fan access in F1 is minimal at best. And it is expensive. Tickets for the events are much more than tickets for a CART event." According to Rahal, tickets for the Malaysian GP had to be given away not because it wasn't popular, because local fans couldn't afford the high ticket prices. As for the series, again there are big differences. "A grand prix is a very different deal. Many are state funded, a quasi-private arrangement. Bernie Ecclestone is even the promoter for a couple of the races." "In CART the teams are somewhat at the mercy of chassis and engine companies - they buy what someone else has designed, sometimes with no input. In F1 the team is responsible for a lot more." 1. Affordability based on controlled price engines and chassis. 2. Accessibility of equipment to any team. 3. Opportunity for drivers interested in competing in open wheel cars on oval tracks. 4. Close, competitive racing in new markets for open wheel racing.